For the next 300 years the guilds, controlled by master craftsmen for their own benefit, strove to maintain the integrity of their trades, mostly by controlling apprenticeship. The law set seven years of servitude. Each master had a limited number of apprentices, usually three or fewer. Apprentices lived in the home of the master and were fed and clothed, but received no wages. Whipping was legal. 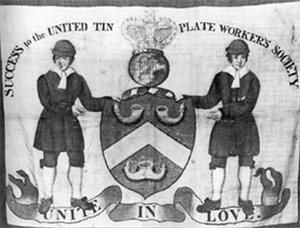 The first evidence of formal union organization in the trades is a handwritten book of articles of the Friendly Society of Tin Plate Workers of London, 1798. At that time and for several decades after, union organization was illegal. The objectives of the friendly societies were deliberately vague, suggesting their primary purpose was to aid members in distress through unemployment or illness. By the beginning of the 19th century, coppersmiths were working mainly on vats and boilers for breweries and distilleries, the shipping industry, or producing copper utensils. Tin plate workers made pots, pans, kettles, baths, lamps, dairy equipment and a range of other household and industrial items. In 1815 the summer work hours were from six o'clock in the morning until seven in the evening from Tuesday through Friday. Work started an hour later on Monday and finished an hour earlier on Saturday. In winter it was from eight until eight Monday through Friday and eight to five on Saturday. Christmas Day and Good Friday were holidays. Strikes were rare. One British historian was able to record only 433 strikes in all trades in all of Britain between 1717 and the end of the century. In the years that followed, however, industrialization and the development of larger companies created conditions that caused workers to turn to various forms of collective action. One early struggle was the campaign against the law that made collective action by workers illegal. In 1824 the laws were repealed and a wave of wage claims and strikes swept the country. The campaign also resulted in establishing the first national union of tin plate workers. Although the organization only lasted for three or four years, it marked the beginning of the path toward an effective union. The formation of the General Tramping Union of Tin Plate Workers in 1861, followed by the Amalgamated Tin Plate Workers of Birmingham and Wolverhampton led eventually into a merger as the National Amalgamated Tin Plate Workers in 1900. Later, as the organization embraced other trade groups, it became the National Union of Sheet Metal Workers, Coppersmiths, Heating and Domestic Engineers. In 1983 the union became the craft section of the Amalgamated Union of Engineering Workers (Technical and Supervisory Section). A further merger in 1990 created the Manufacturing, Science and Finance Union, an unusually diverse conglomeration. Even before the American Revolution, British and Irish settlers in the northeastern states had established a tradition of travelling tinsmiths â€” the original Yankee peddlers. They brought their household tinwares to the sparsely settled countryside, often doing custom work to fit farm or household needs. Coppersmith shops became common after the advent of copper mining in the middle of the 18th century. The coppersmiths produced both heavy and light domestic wares, but also produced much fine work. 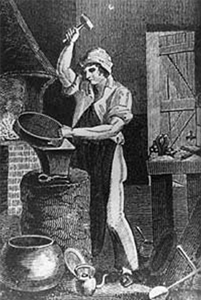 Paul Revere was originally a coppersmith. After the American Civil War, the demand for skilled craftsmen was great, but an economy that was experiencing intense boom and bust periods also created great insecurity. Trade union organization was spreading rapidly, but employer and government opposition was fierce. In 1887, Robert Kellerstrass, secretary of the relatively large and well established Tin and Cornice Makers Association of Peoria, Illinois, took the initiative in establishing a national union. For months he communicated with tinnersâ€™ locals where ever they could be found. Finally, a founding convention was set for Toledo, Ohio, on January 25, 1888. Delegates from Illinois, Missouri, Nebraska, Tennessee and Ohio met for four days, establishing the Tin, Sheet Iron and Cornice Workers' International Association. In five years the organization grew to include 108 locals, to be found in most of the United States. In 1897 the organization became the Amalgamated Sheet Metal Workers International Association. In 1903 the name changed to the Amalgamated Sheet Metal Workers International Alliance. The current name â€” Sheet Metal Workers International Association â€” was adopted in 1924. Currently, the union has more than 150,000 members in North America. In 1896 the first local was chartered in Canada, in Toronto. Four years later a second followed in Montreal and in 1902 in Vancouver. Today the Sheet Metal Workers International Alliance (SMWIA) has 24 locals in Canada.